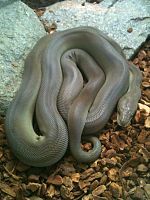 Liasis is a genus of nonvenomous pythons found in Indonesia, New Guinea and Australia. Currently, 5 extant species are recognized and one giant fossil species L. dubudingala, estimated to have been around 10 m (33 ft) in length. They are found in the Indonesia in the Lesser Sunda Islands, east through New Guinea and in northern and western Australia. ^ a b c d "Liasis". Integrated Taxonomic Information System. Retrieved 10 September 2007. ^ Scanlon, J. D.; MacKness, B. S. (2001). "A new giant python from the Pliocene Bluff Downs Local Fauna of northeastern Queensland". Alcheringa: An Australasian Journal of Palaeontology. 25 (4): 425. doi:10.1080/03115510108619232. Wikimedia Commons has media related to Liasis. Liasis at the Reptarium.cz Reptile Database. Accessed 10 September 2007. This page was last edited on 6 January 2019, at 16:31 (UTC).